The shovel guitar is what musician Justin Johnson has chosen to crank out the blues, and crank them out very well at that, in this impressive and viral-achieving video. Which sees him nonchalantly using a standard garden spade,built for digging holes, turned 3-string instrument to play some slide guitar like it ain't no thing. But while although all credit to the music must rest with Justin Johnson, the shovel guitar itself was built by Mississippi Blues Guitars. You can even purchase one yourself, although it will set you back $450.00. According to Johnson's website the guitar is based on the design from the one he used in the video and each one is custom made by hand and fully electric. Each Justin Johnson Signature Shovel Guitar has a unique serial number burned into the handle and each pickup is also engraved with Justin Johnson’s signature. How cool. But just having the shovel guitar obviously won't guarantee that you'll be able to play it well. You'll need some guitar-playing prowess. Because Justin Johnson is not only a Nashville recording artist, but he's also a guitar instructor—the founder of Roots Music School in Nashville—a guitar builder, and a touring musician. So the man knows his way around strings. Testament to that is the fact that if you closed your eyes, you would have no idea the song was being played on a tool used for digging holes in your yard. How you get an amazing sound like this from a shovel guitar is a mystery to those of us who have the musical ability of a brick wall. Check out Justin Johnson's 3-string shovel guitar playing tuition video above if you fancy learning how to play. 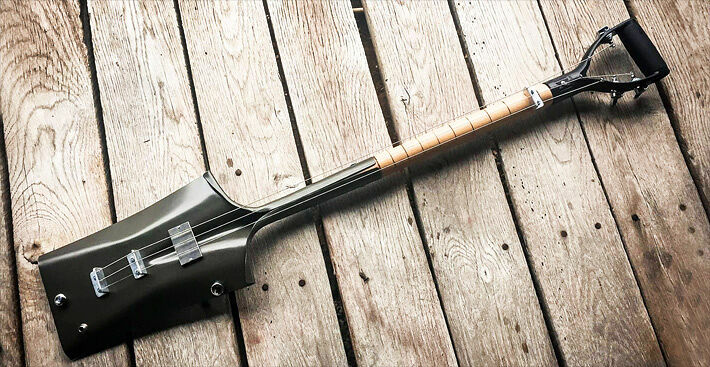 Of course, just because a spade makes for a great-sounding 3-string shovel guitar, don't then be mistaken and think it could work the other way around too. For instance, don't take your Gibson Les Paul out into the yard to dig a hole. You're going to end up with one expensive—and probably incomplete—hole and one ruined guitar. And i can guarantee it won't sound good. See more from Justin Johnson at his website here and check out his 3-string version of 'Ace of Spades' below..
"ACE OF SPADES" on the 3-String Shovel!